I haven't been designing much this week; I'm in crank-em-out sample mode, so not a whole lot to show you right now. I did manage to finish a bunch of these masculine birthday cards for my work card stash this week using Our Craft Lounge's "Life is Sweet" stamp set. 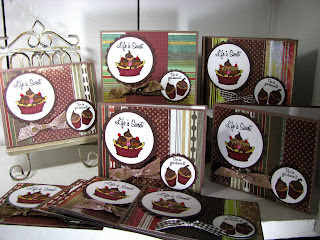 I wanted the cards to look 'chocolately', so I used up old paper that had brown and burgundy colors in it, and colored the ice cream and cupcakes so they looked 'chocolatey' to match the paper! Have a sweet Thursday, everyone! Mmmmmmm chocolate! These look great in chocolate LZ! 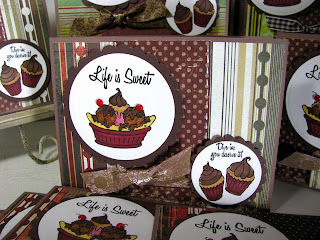 Yes ... my awesome stampin' friend ... Chocolate "anythings", including birthdays, are delightful! Most of all, your version of choco-b'days is the bestest of all. Yum Yum! Hugs @ ya pretty lady! very cool! I love the chocolate feel to these. How yummy!! Love these creations!! TFS!